We got into Westport and restocked the galley before heading out to Cape Foulwind - adeptly named by Captain Cook in 1770 when his ship was battered by gales and rain near here. Cape Foulwind is situated approximately 12km south of Westport at the road end and has a walkway up to the lighthouse. We chose to try out a gravel road which ran off to the right of the lighthouse track to see where it would lead us - it almost looked like the driveway to a house! 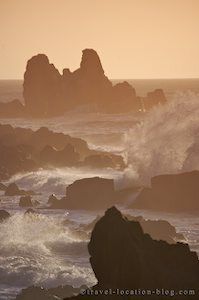 Luckily it brought us out just above the rocky and rugged coast of Cape Foulwind with large ocean rollers sweeping in and crashing into the rocks just below our feet. The display was stunning! Cape Foulwind has a thriving Fur Seal Colony which is one of the main attractions along with the lighthouse walk. The seals can be seen in Tauranga Bay at any time of the year, however summer is the best time to see the newborn pups. We set up for sunset shots and dinner then decided it would be a great place to camp for the night and didn't see any signs prohibiting camping there. We dozed off to the sound of the roaring ocean!